[14:48:31] <rayh> I'd support that. [14:54:59] <rayh> Long ago we had a similar report run from tickle. Your setup here is much more detailed. [15:05:15] <jepler> I don't think I knew about that. [15:37:40] <rayh> That was way back. [15:50:12] <rayh> jepler, Do you have image magic on your default ubuntu install? [15:50:52] <rayh> a command "convert -v" should give a pile of reply. [15:54:19] <jepler> why do you ask? Did I write something that requires it? [15:59:46] <rayh> Okay. I instalaled it for my LyX program but was going to suggest another ubuntu user compress images with it. 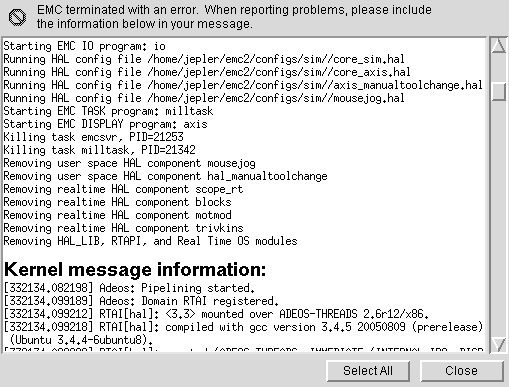 [20:58:24] <jepler> someone with systems other than ubuntu should add regular expressions to recoginze the first kernel message logged by emc when it starts; I hardcoded a string that the adeos.ko module prints when loaded.